Mitt Romney offered a partial snapshot of his vast personal fortune late Monday, disclosing income of $21.7 million in 2010 and $20.9 million last year -- virtually all of it profits, dividends or interest from investments. The couple gave away $7 million in charitable contributions over the past two years, including at least $4.1 million to the Church of Jesus Christ of Latter-day Saints. 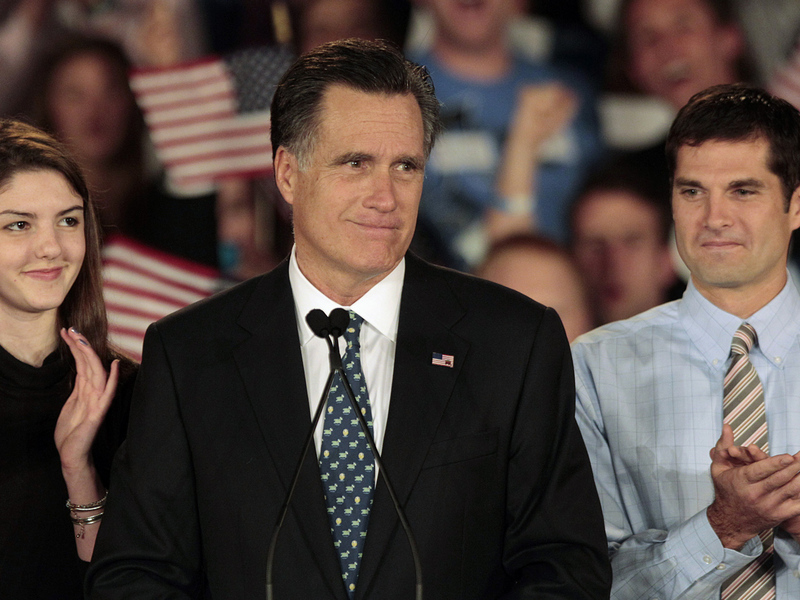 Romney's family has for generations been among the Mormon Church's most prominent members. For 2011, Romney estimates that he will pay about $3.2 million, for an effective rate of 15.4 percent. That's in line with his earlier estimates, but sharply lower than the rates paid by President Obama and Romney's closest Republican rival, Newt Gingrich. "You'll see my income, how much taxes I've paid, how much I've paid to charity," Romney said at a debate Monday night in Tampa. "I pay all the taxes that are legally required and not a dollar more. I don't think you want someone as the candidate for president who pays more taxes than he owes." He said his tax bill is "entirely legal and fair," adding: "I'm proud of the fact that I pay a lot of taxes." Romney released his tax returns -- nearly 550 pages, including the 2010 returns for three family trust funds and a foundation -- in a bid to regain his footing in the Republican presidential campaign after stumbling badly in last weekend's South Carolina primary. In recent days, Romney's GOP rivals have pressed him to make his returns public, arguing that it is critical for the public to vet his finances before the party settles on its nominee. The revelation that Romney pays a significantly lower tax rate than most wealthy Americans underscores his image as a multimillionaire financier, an image that some Republicans believe would hurt his chances in the general election. "The president believes that it is not fair -- inherently not fair -- that those who are millionaires and billionaires pay at a lower rate than average Americans who are struggling to get by," White House press secretary Jay Carney told reporters Monday. "This theme about economic insecurity for the middle class . . . is what got this president into politics. So this is a foundational belief for him, and he's happy to have that debate." Because the bulk of Romney's income flows from investment profits, it is taxed at a flat 15 percent rate, far below the highest rates on ordinary wages. Romney's overall tax rate is in line with that of the average American taxpayer. However, it has drawn fire because the federal tax system is designed to be progressive -- the more you earn, the more you are supposed to pay. Romney's tax documents are voluminous and extraordinarily complex, and his opponents are sure to comb through them in the coming days. They reflect the far-flung finances of one of the richest men ever to run for president. His 2010 tax return alone runs to 203 pages, crammed with information about foreign holdings, contributions to family trusts -- and even a Swiss bank account. In a conference call with reporters, Brad Malt, Romney's trustee, called the Swiss account "fully legal, fully disclosed" but said it was closed in early 2010. He added: "The income earned on that account is taxed just as any other domestic or other bank account owned by the blind trust." "These entities are not evading one dime of taxes," Malt said. Monday's disclosure marked the first time the former Massachusetts governor has released his personal tax returns. Though Romney has relied on his wealth to finance his political career, he did not disclose his tax returns in his three prior campaigns -- not even in the 1994 Senate race, when he blasted Sen. Edward M. Kennedy (D-Mass.) for failing to release his own taxes. This time, Romney had hoped to keep the details of his finances under wraps until he won his party's nomination. But over the past week, as even his Republican rivals raised questions about whether he had something to hide, he concluded that the political cost of secrecy had grown too great. It was unclear whether Romney's disclosure would achieve the more immediate goal of silencing his GOP rivals as they barrel toward a critical showdown next week in Florida. Polls show him trailing Gingrich, who suggested Sunday on C-SPAN's "Washington Journal" that he was ready to let the tax matter drop. "As far as I'm concerned, that issue is behind us," Gingrich said. Critics say such income, known as "carried interest," should not be counted as investment earnings because private-equity partners are mostly relying on the money of others rather than their own. The returns show that Romney earned more than $13 million in "carried interest" over the past two years. Complicated as they are, the tax returns provide only a partial picture of Romney's wealth. They don't show the full extent of his net assets, which are estimated to be worth between $190 million and $250 million. Romney has an individual retirement account worth between $20.7 million and $101.6 million, according to his 2011 financial disclosure. He also has a blind trust for his wife, Ann, containing $10 million. This article was written by Lori Montgomery, Jia Lynn Yang, Philip Rucker for The Washington Post.